Do you want to work with TV? 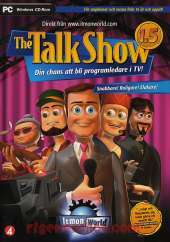 Do you want to lead a talk show? Now you have the chance. Make sure your DIN show is the most spectacular of them all: Cancel boring guests; Provide trouble and conflicts; Get the audience screaming, cheering and bowing. A real conflict is never wrong, but make sure that the guests survive. At least until the end of the program. Listen to the producer. She gives you tips, but she can also give you a kick. Save the best shows at itmonworld.com. There, all other players can see your shows. In the wilderness where reindeer roam freely - we find a settlement of just under 100 souls living in an old extinct volcano. Here the passion and self-esteem thrive - here are those who have chosen to go their own way. Here is what would later be called "Itmonworld". The guests of The TalkShow all come from this insane world. And as a host, you should reveal the secrets of their lives and relationships. Through the charismatic presenter Froderick Bertleback, you now have every chance to succeed with your very own talk show.